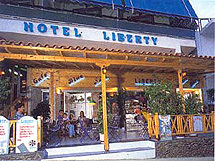 Hotel Liberty 1 is only 50 metres from the beach. It is regarded as oneof the best hotels at its class. The hotel is ideally situated in the centre of Agia Marina. To the right of the port there is a wide sandy beach used by families with children. To the left, there are rocky formations ideal for diving and underwater swimming. Social life in the resort is concetrated around the main commercial street (full of shops, restaurants, cafeterias, discos and popular art shops) and the little vertical roads which connect it with the beach.